The above seems like a short, simple message on a holiday, but I thought the same thing on Columbus Day. I was on my way to a Fontana school board meeting, in unknown territory, when I stopped for dinner at Taco d’Oro, which is cater-corner from the school HQ, and down the street from Fontana High. Other neighbors: a vacant lot, a hair salon and a church. 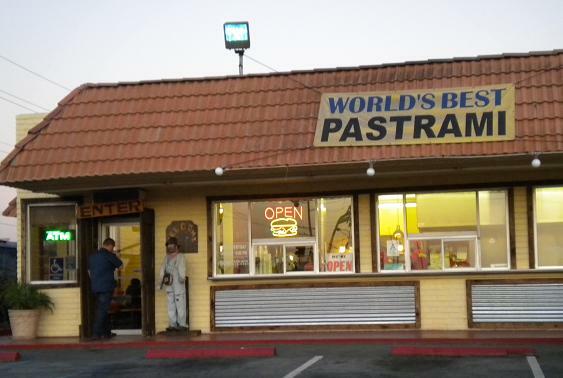 A banner on the Taco d’Oro roof proclaims “World’s Best Pastrami,” a claim not often made at Mexican restaurants. What the heck, I went in. 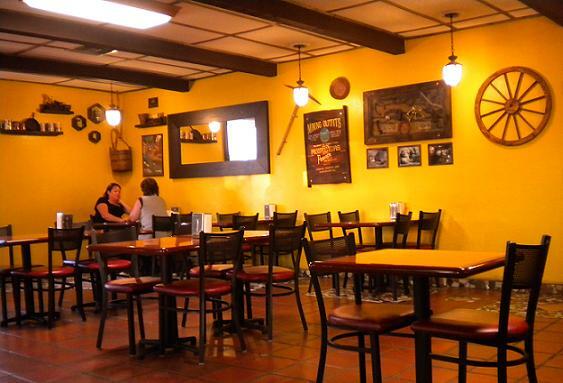 Taco d’Oro (“Gold Taco”) is a rarity: a theme fast-food restaurant. It’s decorated in Gold Rush style. A prospector statue is out front, and inside there’s a water feature that resembles a mining sluice, a pick and a pan on the wall, swinging doors to the restrooms, wanted posters and other touches of character. In other words, a working-class Claim Jumper. They have burgers, sandwiches (BLT, cheese steak, etc. ), tacos, burritos and quesadillas. 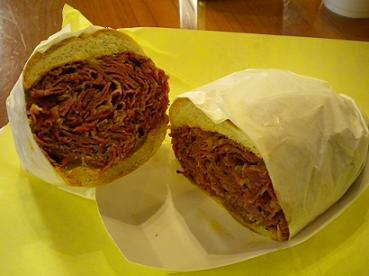 I went for the hot pastrami ($6), which came piled nearly two inches high on a roll with mustard and pickles. I would pronounce it an above-average gut bomb. World’s best pastrami? Please. Fontana’s best pastrami? Possibly. 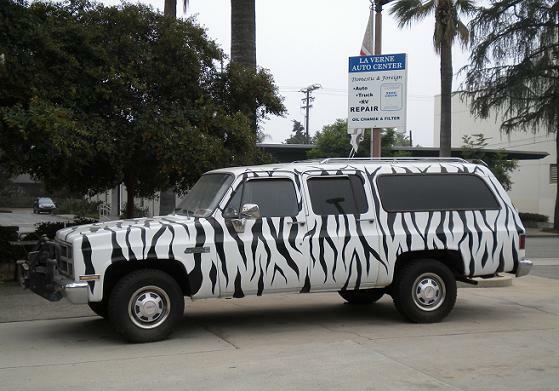 The pickup seems to be attempting to blend into the African veldt. 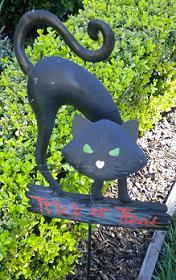 But it’s in downtown La Verne, where it stands out even with a leafy tree as a backdrop. Toasted ravioli, frozen custard and St. Louis-style pizza were among the items we had this time, and we ate at the popular Midwestern chains Steak ‘n Shake and White Castle. Anyway, the menu was the same, as far as I could tell, but I enjoyed handing over my Panera rewards card for the employee to swipe. Somewhere in the organization, a computer is puzzling over my card’s sole points of use: Rancho Cucamonga, La Verne…and St. Louis. Saratoga Lanes, St. Louis, Mo. As mentioned in my Sunday column, I’ve been bowling frequently this year, usually during off-peak hours to save money. All of our local bowling alleys have deals that can save you dough, as long as you don’t mind bowling at, say, the middle of the day, nights after 9 p.m. or before noon on a weekend. Currently you can bowl at Montclair’s Bowlium for $1 if you get there between 9 and 9:30 a.m. weekend mornings, or for $1.50 if you’re there after 9:30 but before 11. They have a lot of regulars, including seniors. One man brings three bowling balls and polishes them after each roll. Another carefully points his feet just so before beginning his approach. A few times I drove to Covina Bowl for 98-cent games. I like its midcentury modern bowling alley, but Covina proved a long way to go to save two cents. Here are links to the website of each Inland Valley bowling alley, where you can search for deals or find out more. Look under “prices” or “specials,” and remember that the specials may change from time to time. 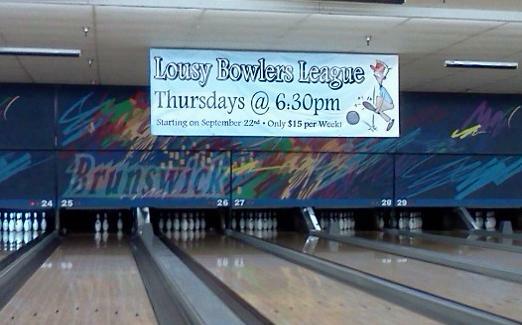 * The Bowlium, 4666 Holt Blvd., Montclair. * Brunswick Zone Upland, 451 W. Foothill Blvd., Upland. * Brunswick Deer Creek Lanes, 7930 Haven Ave., Rancho Cucamonga. * Chaparral Lanes, 400 W. Bonita Ave., San Dimas. * Brunswick Foothill Lanes, 17238 Foothill Blvd., Fontana. 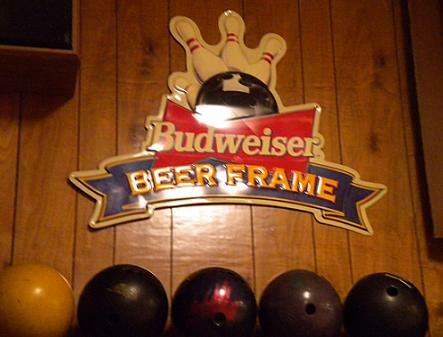 * Brunswick Classic Lanes, 1800 Hamner Ave., Norco. * Brunswick Covina Bowl, 1060 W. San Bernardino Road, Covina. * Oak Tree Lanes, 990 N. Diamond Bar Blvd., Diamond Bar. 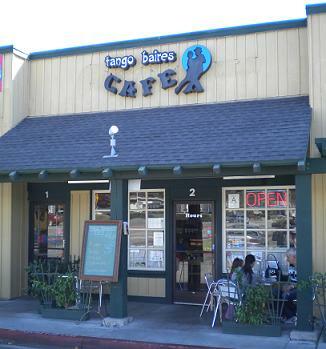 The only full-service Argentinian restaurant in the Inland Valley (a takeout place, Empanadas to Go, is in Chino), Tango Baires has been in business since about 2000 in a small shopping center on Foothill Boulevard in Upland. It’s next door to a Baskin Robbins and a couple of doors from Brandon’s. 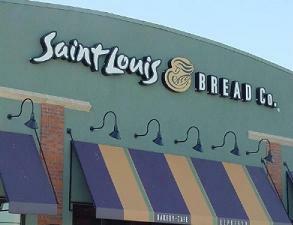 I ate there once or twice not long after it opened and had vaguely desired to return. A chance came recently with two friends, one a first-timer and the other a frequent customer who discovered the place last year. Tango Baires is small, with only a half-dozen small tables, but is colorfully decorated and cozy. Although it’s a cafe, they take your order at your table. Our server was relaxed and cheerful. 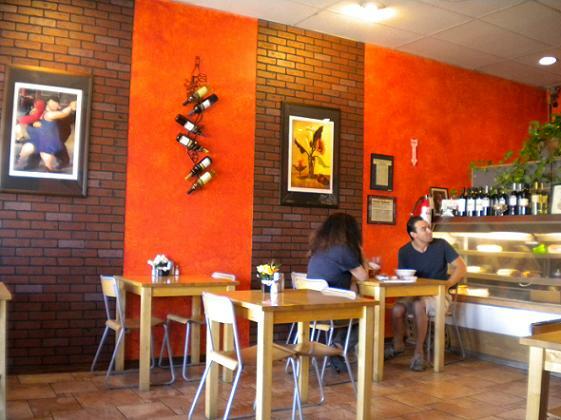 The menu has salads, hot and cold sandwiches, barbecue, steaks, pastas, pizzas and desserts. Argentina has a large Italian population and the country has put its own spin on traditional Italian dishes. The menu is online with helpful descriptions. The restaurant is also open for breakfast, with a few items, but they don’t open until 10 a.m. on weekends and 10:30 on weekdays, so the cafe may be on a different schedule than you. 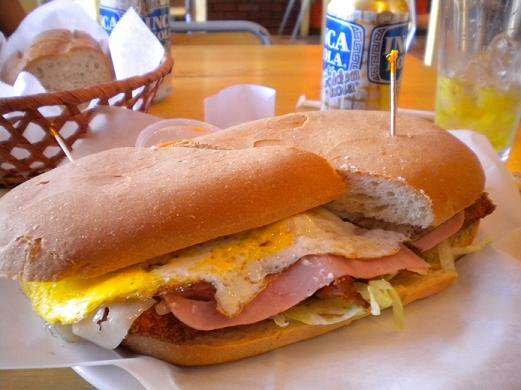 I had the milanesa cordobesa sandwich ($8), a breaded steak with ham and a fried egg on top, and lightly toasted. Tasty, and also enormous; half would have been a decent meal. The first-timer got the pesto Tango Baires pasta ($11.90) with chicken ($2.50) and liked it, although he preferred the bit of the sandwich I shared. “I’d come back,” he said. The regular, who is vegetarian, got the fugazzetta pizza ($7 for a half), which is mozzarella, black olives, onions and oregano on an airy, pastry-like crust. The half was five slices. “This tastes just like the food I had in Buenos Aires,” she said with a contented sigh about her recent vacation. I wouldn’t know. 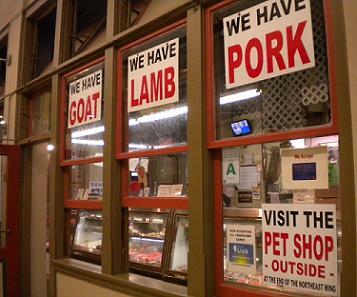 For me, it was just a pleasant meal in Upland. I love the caricature of the guy dropping the ball on his foot. Seen at Brunswick Zone in Upland. A takeout meal? No, leftovers from a single meal at Norms in Claremont. 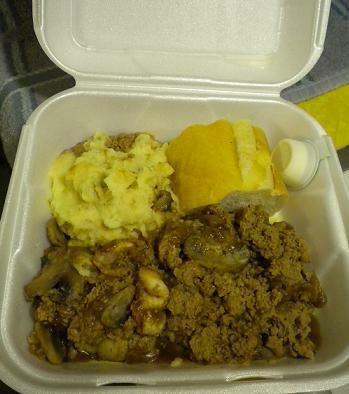 Arriving at 4:50 p.m. one recent Saturday, I ordered off the before-5 menu: soup, salad, meatloaf, mashed potatoes, vegetables and a mini hot fudge sundae, all for $7.99. The food was pretty good. The leftovers, seen here, made for two modest but satisfying meals. 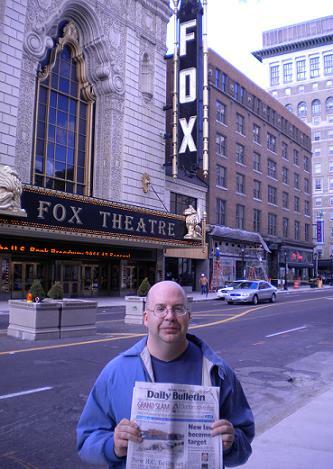 Fox Theaters aren’t only in Southern California. 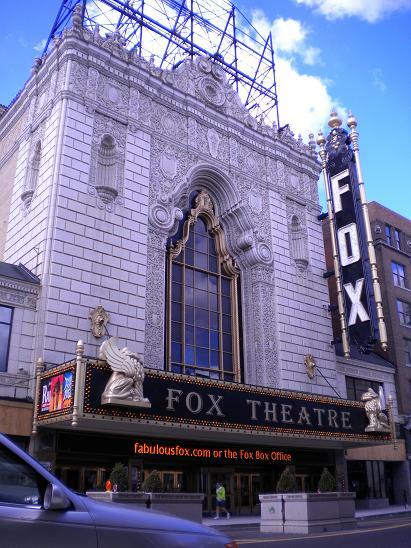 St. Louis’ Fox, part of the same original chain of movie theaters, sat three times more than Pomona’s (5,060 compared to 1,731). I admired the building from the outside while on vacation last week. A full-length view of the theater without any distracting newspaper-brandishing columnists is below. By the way, what did I miss while I was away last week?